Stay Connected...Join the Harris-Stowe Alumni Network! Harris-Stowe State University now has our own social network! Click here to go to HSSU’s Alumni Network Platform page to reunite with University friends, browse pictures, watch videos and learn about all the exciting upcoming University events! 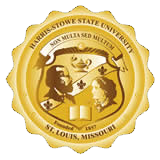 Don’t forget to sign up as a “fan” of Harris-Stowe State University to show your school spirit. Go Hornets!